As November calls for an attitude of gratitude, I will try to frame this post accordingly despite my exhaustion from this past month’s activities. I’m not, as you may expect, referring to Thanksgiving dinner, holiday travel, or family arguments, but to journal package renewals — a critical annual activity for acquisitions and collection management librarians, vendors, publishers, and (as concerns this post) library consortia. Consortia are member organizations that utilize the greater power of a collective body in order to influence more favorable outcomes than the individual bodies might be able to alone. Consortia in libraries historically began as a means of sharing resources, such as books via interlibrary loan or labor resources via union cataloging. Consortia services evolved along with library collections to include collective e-resources licensing, acquisition, and access to online resources. As a librarian responsible for acquiring, licensing, and sharing collection resources, I appreciate the efficiency of labor that consortia offers these workflows. In the shared purchasing realm, consortia facilitate a singular license negotiation process for its member libraries and negotiate unique pricing terms for content, often packaged in the form of so-called ‘Big Deals’. Perhaps less often, but just as important, consortia use a collective influence to represent and voice members’ shared concerns. This summer, I participated with consortia voicing opposition to an unfavorable publisher policy that would limit access to online content, which succeeded in winning a reversal from the publisher. Now libraries have been questioning the value of the Big Deal, consortia or not, for some time. Yet many libraries continue to commit their budget dollars to it year after year, perpetuating its existence and the lack of any market alternatives. Being up to my eyeballs in four simultaneous Big Deal analyses for the past year and a half, I’m so ready to call these deals’ bluff. To be clear, Big Deals are not exclusive to consortia arrangements. Many libraries subscribe and break from such deals all on their own, as this popular SPARC resource can affirm. https://sparcopen.org/our-work/big-deal-cancellation-tracking/ However, consortia arrangements of Big Deals cause big problems for libraries because in the process and effect of these arrangements, consortia don’t function as a consortia. Here’s why. Purchasing bulk packaged content like the Big Deal based on libraries’ historic spend, as opposed to publisher list price, does translate to a kind of library savings. It also creates a predictable budget projection for libraries and a predictable profit for publishers due to fixed annual increases negotiated as part of these deals. That’s pretty much it for the benefits, and even those don’t hold together. 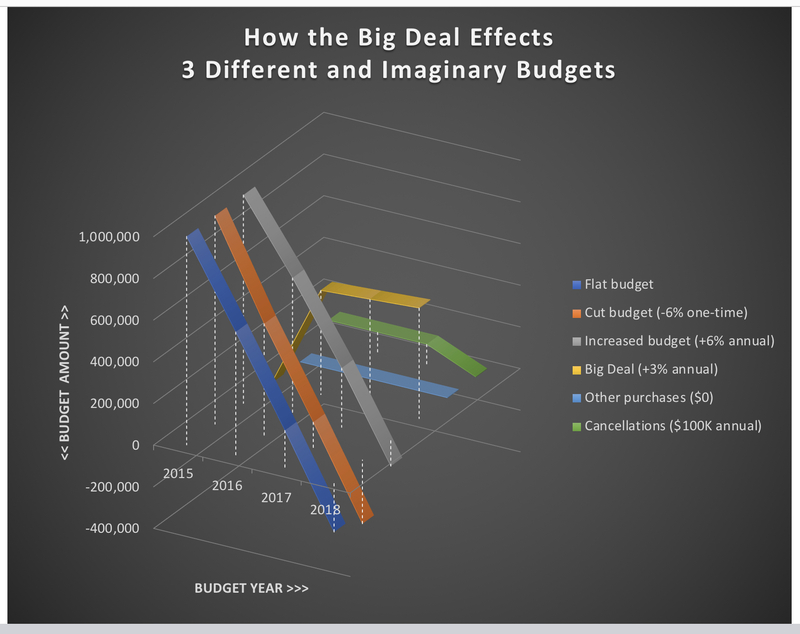 Any consortia benefit from predictability in library budgets gets completely outweighed by the elimination of libraries’ flexibility to reduce spend when needed, as both commitment to spend and content are locked into these deals. Likewise, the compounding cost of annual increases have a predictably deficit effect on library budgets. This inflexibility also leads to homogenized library collection-building (Thomson, Peters, & Hulbert, 2002), as libraries share and provide access to the same scholarly content, rather than (as in traditional resource sharing) resources unique to their respective collections. Also, a significant portion of Big Deal package content remains unused, falsely inflating its overall value and trapping libraries in multi-year agreements to buy what they don’t need and increasingly can’t afford. This kind of purchase means fewer library collection dollars spent on more diverse collection needs, whether because there are fewer such purchases that can be afforded, or even simply that these remain more possible to cancel. Quite basically, the normal expectation for a renewal process means library data gets analyzed by collection representatives in the spring for final decisions in the summer. Ideally, those decisions get communicated to acquisitions representatives, vendors, and/or consortia reps in the early fall. Then consortia and e-resource librarians (plus respective general counsel) negotiate new contracts before the December expire. The actual renewal process looks quite different. Since publishers don’t release current pricing until summer, consortia get offers out for its members’ collection representatives to analyze in early fall. This compressed timeframe leaves little room for libraries making consortia purchase decisions to analyze anything, nor does it allow sufficient collaboration from all necessary stakeholders. To share is the Latin root of ‘communication’. Again, quite basically, the shared information concerning consortia ranges from books to labor to negotiating power. But what works well for sharing books and its associated labor is quite different from sharing information related to negotiating power and the labor associated with managing online resources. Besides the varying usage value of these purchases, the contract and term needs continue to vary from library to library. Those needs can change more frequently each year for libraries than buying, sharing, and cataloging books ever has. New formats beget new kinds of information, requiring new structures, methods, and individuals involved in the communicating. From my vantage point — and, I grant you, there are many that I am missing here — libraries and consortia are falling short of what’s necessary to collectively communicate in ways that make consortia purchases beneficial to libraries. Machovec (2017) sees two competing forces at stake for consortia and libraries: “the need to grow collaboration to more efficiently acquire products and services; and the need to cut programs and services that can no longer be funded” [emphasis mine]. To grow collaboration, as I interpret Machovec to suggest, means allowing more time to share, react, analyze, and compare collaboratively, not just the group individually. 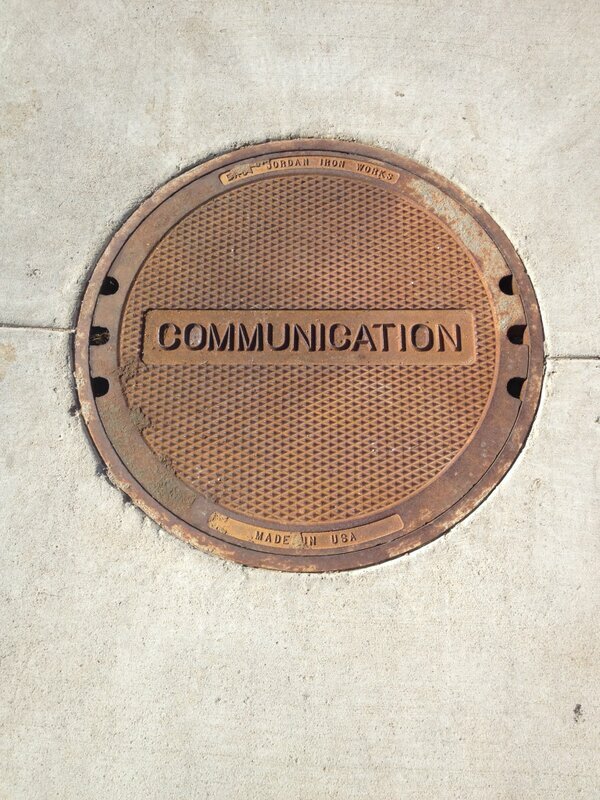 I know it sounds counterintuitive that more communication would be necessary for efficiency. But understand, efficiency doesn’t just deal in the currency of predictability. The currency we should value is flexibility. Currently, consortia purchasing models, while designed to save libraries money, still offer no comparable programs and service alternatives to address libraries’ collective declining funding. I believe consortia have a role to play in negotiating favorable alternatives or so-called “exit terms” for its members, just as they may continue to offer well-negotiated Big Deals for members needing and willing to afford that kind of predictability. I don’t believe these two interest necessarily conflict, considering how libraries have historically participated in consortia. But having been part of a group of libraries working on that kind of proposal, I have greater appreciation for the complexity and skill involved and a new perspective on future possibilities. For consortia to stay in the purchasing game, from which at least part of their operational funds rely, they will need to grow the facilitation and communication side of their business. Investing in people, systems, skills, and new relationships will be key to negotiating different alternatives and to negotiating the complexity of members’ changing needs. The title for this post inspired by the song by Ariana Grande, in case you wanna listen. Thompson, J., Peters, T., & Hulbert, L. (2002). Library Consortia. The Serials Librarian, 42(3-4), 177-182. Machovec, G. (2017). Trends in Higher Education and Library Consortia. Journal of Library Administration, 57(5), 577-584. Invisibility and Ubiquitousness: How Digital Libraries Should Tell Their Story. Under pressure from the presumed loss of influence, the contemporary academic library is often in the business of staking claims on campus. We see new technology or innovations as opportunities to ingrained ourselves deeper in the future of the institution. Partially, this is a reaction to the change in the world and a move away from books but also a survival strategy in declining budgets. As the Ithaka survey on “Library Leadership for the Digital Age” last spring told us “All libraries are now digital…. Users think libraries are—or at least should be—digital.” As someone who left the print world for the digital, I can say within my own experience this is true. What I am finding, though, as a new digital librarian, that our work is still ignorable and invisible. The reasons for this might seem contradictory. One, the digital library is not traditional library work and is seen as outside of the realm of the library’s scope. On the other hand, the internet and technology is ubiquitous which makes the behind the scenes work expected and ingrained with very little work assumed, with high levels of integration and low levels of recognition. Ubiquity, while central to our digital lives, is, perhaps, the most difficult thing to overcome. When user expect things to be there, or that the digital world should just exist around them, it is difficult to ask for their patience or their work in helping build the digital world in the library. And yet we need their input and their work to makes ours possible. This tug and pull, the pressure to remain a stable part of the institution’s traditional academic world, maintaining print collections and special collections materials and being part of the on campus classroom, while being forced to compete with the google and the always on internet is difficult for our libraries to prosper. The ironic thing being: the better we do at our jobs the less visible we are and vice versa. Unfortunately, intermediation is the only way we are visible to some, and often that comes at the expense of our users. Users want the system to be there without having to feel like they are using the system. Because of google, our faculty and student expect that our services to be available always with little thought to the infrastructures that make it possible. Only when the curtain is pulled back is the process unveiled, usually with disastrous consequences. If the institutional repository, the center of my work, works as it should, where materials are preserved and promoted with little to zero effort given on the part of individual faculty there is no one to complain or question its existence. This requires the input and the collaboration with faculty across the university. Proving that their buy in is difficult when some search engines make visibility so seamless. As a result, I often tout the visibility of the Institutional Repository in search engines like Google Scholar to show that it is “working.” The same thing exists on the technical end, if our online catalog bridges the gap seamlessly between physical location and online direction, then no one chats to complain they can’t find a book. That book, found via the Online Catalog, is retrieved with very little noise aside from the ding of the barcode scanner. Only when things are visibly broken does our work become a point of either discussion or contention.But how then do we talk about our roles in the larger campus community if our work is largely behind the scenes? In someways, we are forced to tell our stories to our Deans and Provosts about what we do for the library and the institution. This can be done in a number of ways, and best practices have yet to be fully established. The Digital Library Federation’s Assessment Interest group is focused on how we can assess the work that we do. We can count the amount of money that we bring in during digitization projects or we can measure the encounters and shares as part of larger schemas of impact for promotion and tenure purposes. There are great guides to Google Analytics and Altmetrics through the DLF assessment, but this is reactive instead of proactive. And requires us to justify our existence through outside tools and after things have been posted, not to prove why the initial work is necessary. 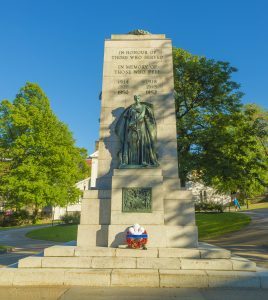 Just as the traditional library has been praised for its collections used to foster learning and scholarship, the digital library must be used to show its importance to the larger campus. This goes beyond showing the web analytical impact, but by showing the use of the materials by people on campus. As I wrote in my piece on the library as more than a mausoleum, it is the use of materials that will save us from irrelevancy and invisibility. There is no simple solution, but a first step is often telling our own story apart from the rest of the library. Perhaps we should be making the case in a way that shows the seams that hold the digital library together with the campus is the way to go. We should use opportunities where ubiquity gives our campus partners feelings that we’ll always be there to tell our story and look for partners. Our seams show not where we are stretched to the limit or where we lack; but where our institutional and collaborative partners can build a larger and better digital community. We will never have ALL the answers to what our community will need tomorrow In our stories we should acknowledge both our failures and our successes and what we need to prosper in addition to build on our successes. We should show the people behind the curtain that make the easy to use interfaces and search functions work well, and increase the stake that our users play in decisions. Digital collections are unique in our library world. Outreach, like social media or regular media, can put objects at the forefront of the infrastructure and makes it all the more likely for our users to think of us when they think about the library, but it is the structure itself that often needs visibility and part of the narrative. Without this narrative, without selling the good that we do behind the scenes, our value is lost in a sea of other sources of information. The resources do not just appear because there is work done to make them available. It is time that we start making that visible. Author Dylan BurnsPosted on May 10, 2017 May 10, 2017 Categories Faculty, First Year Academic Librarian Experience, Scholarly CommunicationsTags Digital Library, Scholarly Communication, UbiquityLeave a comment on Invisibility and Ubiquitousness: How Digital Libraries Should Tell Their Story. How many times have you or your faculty received this message? We at Intellectual and Smart Publishers would love to talk to you about publishing “INSERT PAPER TITLE HERE” in our issue of Smart Things in Science. We offer expedited review! When the Framework for Information Literacy for Higher Education approached “Authority is constructed” little did we know the importance that our work would play in ongoing discussions on the national level about “fake news.” But the contextual and constructed nature of information was given a deeper hold within our field with news of the shut down of notorious Beall’s List. The list, which black-listed publishers deemed by Beall as predatory, was a tool which I used (with a necessary grain of salt) to counsel faculty and student interested in publishing their work. Beall’s enemies, and there were many, celebrated while his supporters, again many, wondered about how libraries and librarians will spread the news about the predators in our wake without his list. How do we define predatory publishers? Predatory publishers (or vanity publishers as they were once known) are publishers with very little, if any, editing or peer review process. Maura Smale wrote a piece several years ago responding to an uptick of press about predatory open access publishers. Any presenter at any national conference will know these predators as their form letters seek to publish your presentations often without knowledge of what you even spoke about. They tout “expedited publishing process” and high impact values, while giving very little in return for your investment of dollars for publishing. Slate writer Joseph Stromberg has an excellent piece on publishing his thesis with a notorious publisher. Weakness is an incredibly loaded term, but we are naturally suspicious of the merit of books published under such circumstances and of the scholar themselves for their unwillingness to be judged by a jury of their peers. Would books published this way merit publishing through traditional processes? Perhaps but also perhaps not. Overwhelmingly, these predatory publishers target our most vulnerable university community members, who are driven to “publish or perish” to continue the cliché. (Lud?k Brož, Tereza Stöckelová, Filip Vostal do a nice overview of “bloodsuckers” in publishing) Students and new faculty are often pressured to publish at any cost and these emails fill that need to publish anywhere and everywhere. Yet, we know that Howard Sullivan’s view is the norm rather than an exception; the scholar caught publishing without peer-review is scorned in the university community. A quick search online for “vanity press” or “predatory publisher” and “tenure” see many a frustrated new academic weighing the decisions between not publishing and publishing with a less desirable press. Karen Kelsky, the “professor is in” advice columnist, has approached this topic several times. Summing up that “Putting a book out with an obscure press is not much different than having no book out at all, in terms of gaining a tenure track job or tenure.” (http://theprofessorisin.com/2012/09/21/does-the-status-of-the-press-matter/) While not specifically talking about vanity presses, but merely unknown presses, it is clear that the quality of the press is a significant focus of tenure committees and the angst of new professors. So, what can Libraries do? If anything, this is an information literacy issue. Determining which presses are worthy of your work is something that should be taught in new faculty seminars by librarians whose expertise in the fields of publishing should help guide those led astray. Just as how we feel condescending when we teach searching to our students, it will feel just the same, if not worse, when teaching faculty where to publish. Teaching how we determine the value of information (another hallmark of the 2016 framework) will help our faculty in choosing where to publish, and in the end make them more successful in their career. Even if we assume that our colleagues in faculty positions are experts in their fields and highly educated, the intersection of need to publish and the predatory nature of these publishers “tricks” even the most brilliant into giving their work to them. But the researcher is not the only one tricked by these publishers. The other thing we should consider is who buys these materials. I’m sorry to say that the primary purchasers of these books are libraries, given their price and often microscopic academic viewpoints. We might be the only institutions or persons capable of purchasing such expensive books. We must make an effort from a collection development standpoint to not purchase these books for our collections. In the past month or so I’ve worked with our collection development experts to create policies to prevent Utah State University from purchasing books from suspected predators. There is a huge problem in proclamations like this because the disgust over predatory publishers and vanity presses bleeds into ongoing discussions over the merits of indie publishers and self-publishing. Self-publishing and indie publishing are not straight line indications of lower quality or predatory materials, but it is often difficult to see the differences. In an account of self-publishing in OCLC records, Juris Dilevko and Keren Dali write, “as large mainstream publishers become focused on profit-and-loss statistics (Schiffrin, 2000) and as the demands of bookstores stoke the corporate emphasis on bestsellers (Epstein, 2001), librarians should remember that self-publishers often release titles that would not typically find a home with a profit-oriented publisher. Self-publishers may be one of the last frontiers of true independent publishing.” (Dilevko, Juris, and Keren Dali. “The self-publishing phenomenon and libraries.” Library & information science research 28, no. 2 (2006): 208-234.) This complicates an already muddled picture of what a library should collect; where questions of authority and how to deem a book worthy of our dwindling dollars, are becoming more and more difficult. If faculty ask students to use peer-reviewed sources, should we not ask the same for the books we purchase? The end result would be a world devoid of the divergent voices that appear in indie and self publishing, yet save us from the troubles caused by predatory and vanity presses. A policy, perhaps, where fiction from self-publishing is acceptable but non-fiction is unacceptable? A change in how we value information and published works is in order, yet who will lead that charge? There are no concrete solutions to these issues, but I know if I need to publish on it I’ve already got several offers. This is adapted from a talk at the Utah Symposium on Digital Humanities, February 11th 2017 in Salt Lake City, Utah. Over the last decade, we’ve witnessed a shift in the ways in both everyday folk and academics encounter the world. The promise of web 2.0 and the rise of the network has seen the input of every individual increase in importance. For universities, the consequences of this go well beyond social media presences or heated debates in comment threads, it challenges the very nature of the ivory towers our universities are constructed on top of. Some of the more nostalgic set have opined about the “death” of the traditional library and how universities need to “Save the stacks.” Are we losing the traditional library to chase digital trends? No longer are libraries cenotaphs of long dead books but a growing organism contributed, curated, and built by the members of the university community. 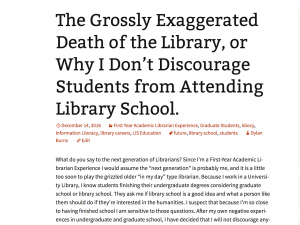 A focus on digital pedagogy, allows librarians the flexibility to enter this new age of librarianship with a clearer idea of what we’d like the library to be 10, 15, or 20 years from now. 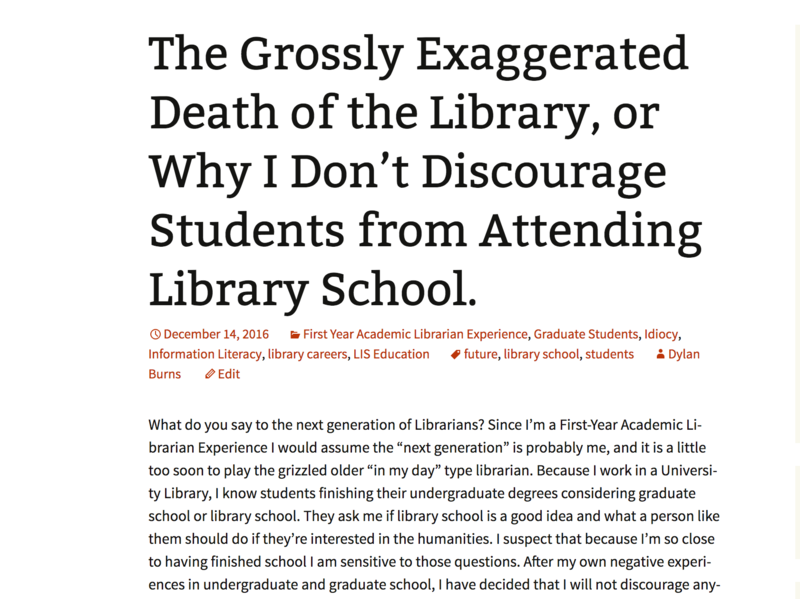 Rick Anderson tells us it is a commonality amongst new librarians to say that the collection is dead. Rather than death, I think of it as a transition as significant as the one from scroll to codex, or manuscript to print. I am choosing to illustrate how I see the future of collections shape up in the digital future. Buildings come in different sizes and shapes, staff perform different roles but collections, that is items preserved for use by research are common in most if not all library experiences throughout history. The collection forms the backbone of our pedagogical role. With this in mind what are the principles of digital pedagogy in modern librarianship? Student voices matter, as much as established ones, in the conversation. The future of library is based on student needs both pedagogical and inspirational and the collection needs to mirror this. By focusing in on the creation of scholarship by students into collections we are building upon the library’s core historical strengths while improving the teaching done in classrooms. We also exhibit examples of student work and learning to the world in perpetuity. And as the digital world encroached on the library, as it did on most of our lives and interactions, the edifices faded. First it was the building, allowing access outside of the footprint of the traditional library, then it was the staff who became teachers rather than guardians, what happened to our prized collections? David Lewis in Reimagining the Academic Library comments that “Until quite recently what constituted the scholarly record seemed clear, or at least we understood that portion that was the library’s responsibility.” (Lewis 32) But that now we have entered a new stage of ambiguity caused by digital objects. Information Literacy exists against this backdrop of unclear scholarly records. This has led some researchers, David Lewis included, to argue that the maintenance of non-unique print collections should no longer be a focus of academic institutions. Instead, digital collections, costing significantly less to maintain and often times infinitely more usable and accessible than singular print copies. While a shift away from the collection of books and toward the teaching and the impacting of students is necessary, I argue it is not an end to the collections based approaches that define the library. While I do not completely agree that our print collections are no longer necessary, our communities are pushing our hands when it comes to demanding access to more digital materials, outside of the building, and off of campus. The loss of the stacks is mourned by many nervous colleagues. Some of this nervous energy has prompted change in library circles. When the Association of College and Research Libraries introduced a new framework for information literacy, it was met, as all change does, with both praise and scorn. Part of this framework was a large redefinition of the task of research, which increasingly takes the focus of librarianship away from books and dust and places it into the classroom. Part of this is the necessary focus on citations as a communicative tool between the researcher and the past, but buried in here is the way in which we can use the tools of the digital to promote our student’s incorporation into this community. It is through digital pedagogy that we have the chance to offer our students keys to this conversation, either through publishing, the creation of exhibits, or the production of knowledge itself. Libraries then need to be at the forefront of this transition, from static collections based and traditional “gatekeeper” mentalities to the research driven and student driven collection creation. While librarians have been quick to reject the gatekeeper mentality, faculty in fields across campus have been hesitant to give up the reins of the academic conversation. Some institutions have had long histories of undergraduate research prior to the age of the internet, it is the openness in the digital world that prompted a revolution in student publishing. Entering this academic conversation encourages students to reject the monolithic scholarly record that dominates our ideas of the University, and telling students their voice matters allows a reconfiguring of the idea of research. The best way to understand research is to conduct it yourself. There are more tangible reasons this is innovative. Feeling that student work is often too “un-polished” or “not up to par” with the rigorous examinations that come after years of graduate school. Some are worried that student work will impact their own standing as professional academics. Bad student work with a faculty name on it reflects poorly on mentorship. In giving the keys of scholarship to our students we promote not only their work but the University as a whole; much like open access creates exposure for us on the Tenure Track, our students become examples. By opening up the collection to reworking by students we not only improve their education but we break down the barriers that hold new ideas back. It rejects the model of the library as a singular direction where the collection is controlled by the librarian and lent to the student or researcher. Instead it breaks down those barriers to encourage the exchange of information and ideas across all levels. Nowhere on campus is better for this kind of interdisciplinary engagement, and nowhere is better suited for the task of preserving collections, albeit digital ones, then the organization trusted with this preservation since Alexandria. This is not a death for the library, or of the collection, but a new beginning.